This painting is a major fail for me, but I am learning something. Firstly, my first layer was rubbish. I tried using wet in dry and it just was not happening. I had also tried to copy the photo which contained more leaves on the left. I hadn’t paid attention to the composition. So I left it for a week. I thought I might start over and maybe do something on the back. And then I thought I might be able to fix it. I added some more more color to the flowers and deepened the background and managed to cover the leaves on the left. My center did not turn out the way I wanted it. I like the leaf and the bee. I used some water color pencils and crayons. Then I went mad with more blue paint, and while it was still wet, put some clingfilm on it. When the paint was reasonably dry, I pulled the clingfilm off. I then used a damp brush to tidy the flowers where the blue bled onto them and crayon to fix certain areas. This is now rather vibrant, and large at A4. I am not finished with sunflowers. I really like this one I made a few weeks ago. It is from the same photo, but upside down. I cannot for the life of me understand how I can follow a lesson almost perfectly, but when it comes to doing my own thing, the watercolors don’t work. I enjoyed the clingfilm experiment and I am going to have to try it again and find better ways of employing this technique. Watercolors can be so difficult to work with sometimes! I might have to paint something in acrylic just to feel good about painting something! I went back to my book and decided to try my hand at painting clouds. This is another small piece. I am going to work small until I am confident of working larger. I followed the lesson in the book. It was supposed to take 22 minutes. It took me about a half an hour, so I must be getting better. I had a few issues with the bottom half of the painting when adding the reflections, but I think I know how to overcome these when attempting something like this again, but from my own photo. My clouds came out better than I expected, and the technique used here was similar to what we did in the class I had recently taken. It was good to complete a painting from start to finish without wondering how I was going to have to fix it as I did in my previous painting! This is the reference photo I used to paint my latest watercolor painting. 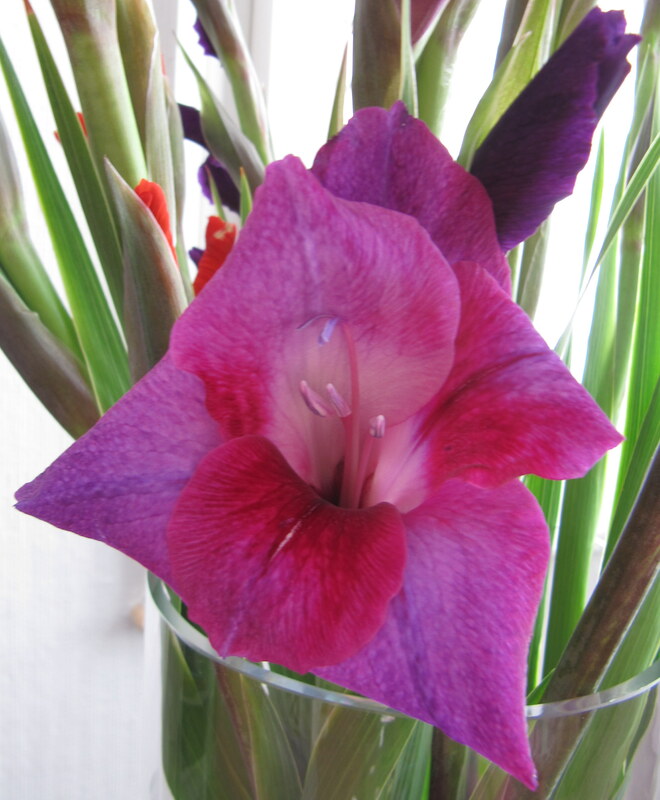 I had a lovely bouquet of Gladioli that I took photos of last year. I was going to try this using the wet-in-wet technique as used by Ross Barbera, who I mentioned in my last post. This is how it turned out. 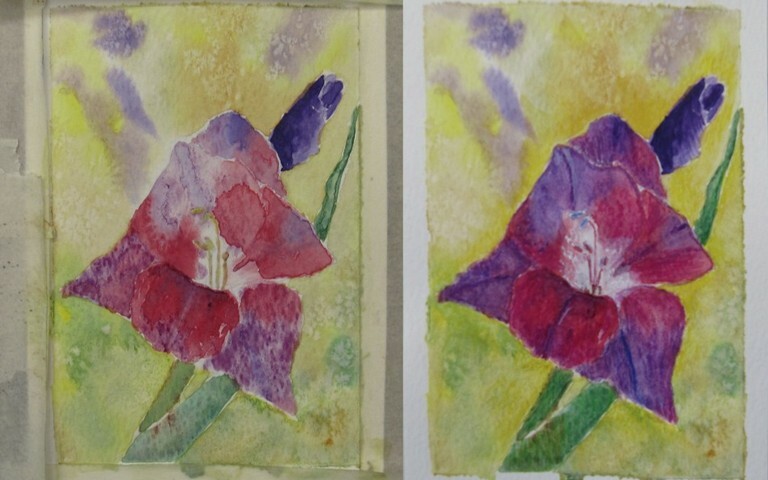 I have tried a new color, Permanent Mauve by Winsor & Newton and a new paper by Daler Rowney, 140lb cold pressed. As you can see, it didn’t turn out very well. The flower has two layers of paint and the second layer didn’t improve it. What I like best is the effect in the background created by the salt. 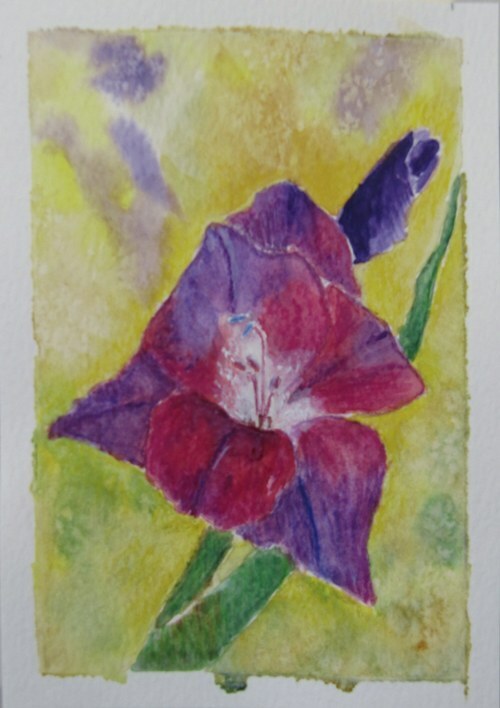 The Permanent Mauve seems to be a color that granulates, which is great for skies and landscapes, but not really for this little flower painting. I left it overnight and decided to see if I could do anything with it by using my aquarelles. This is how it turned out. It is still not great, but it is better and more vibrant. I used my set of Caran D’ache Watersolubles that include watercolor pencils and water soluble crayons. I mainly used the crayons for the flower. This set includes a white crayon and pencil. 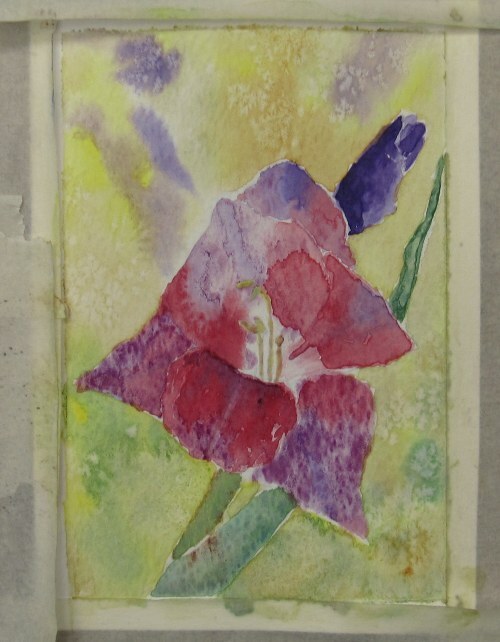 I used a wet brush on the crayon to lift off the color and used it for the white area of the flower. I also used the yellow crayon on the background to make the flower stand out more and a purple pencil to add some shadow and outline a few of the petals to give them more definition. Here is what they look like before and after. I am actually starting to like this now. It’s not the worst thing I’ve ever painted!